Fat Bruce Lee was not attractive enough to be allowed access to Hollywood, so that left it up to me to check out Go Burger during their first week of being open. Go Burger is a BLT establishment, which is brought to us by Chef Laurent Tourondel. This was the LA outpost of the NYC Go Burger franchise. I have been meaning to try BLT in NYC for some time, and this just saved me a ton of gas money. Go Burger only opened in LA three days prior to this review, so I was chancing that they wouldn't have the usual service and quality kinks. Parking on Sunset was what one might expect. The was a line and a list for a table, but since I was flying solo, I sat down at the bar--no waiting--same menu....suckahs. I ordered The Classic, which was a 100% Black Angus burger for $9.00, American Cheese $1.00 (sigh), the Skinny Fries $3.00, the Duck Fat Fries $6.00, and a Diet Coke. The joint was packed, but there was a staff of 8-10 in the kitchen. It did take 30 minutes to deliver a burger, and I chalked this up to newness and an unexpectedly large lunch crowd. The Beef: The beef was a coarsely ground blend of Chuck, Sirloin, Shortribs, and Brisket. There was an upgrade option ($18) for a 30-day, dry-aged blend of Brisket, Shortribs, and Sirloin--next time....I have to imagine that would be on par with the Black Label Burger at NYC's Minetta Tavern, which is simply amazing. The Classic burger's beef blend tasted great. It was strongly beefy. A mild aging came through, band this was expressed as a pleasant end note. The blend was easily beyond 20% fat, which made for a creamy mouth feel. That creaminess was a nice counterpoint to the firm chewiness of the sirloin. 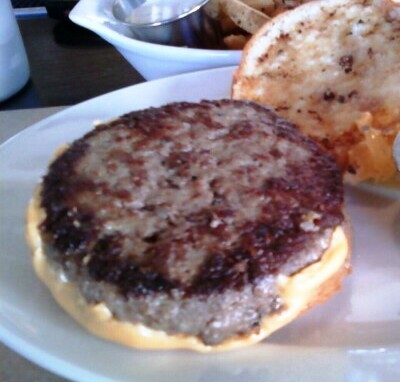 In spite of the fat content, the burger was juicy rather than greasy. The Sear: The partial sear was thin and satisfyingly crunchy. This provided a nice contrast to the creamy beef. The Seasoning: On the first few bites, I hit a patch where the patty was over-salted. Once I got past those first few bites, everything settled in, and the seasoning was well-balanced both inside and out. The Preparation: The 5-6 ounce patty was loosely formed and cooked on very hot griddle. 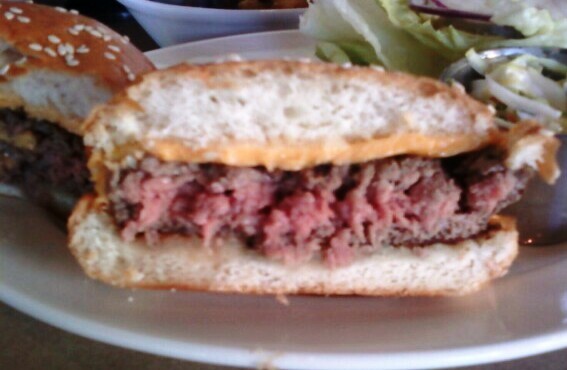 The burger came out to a perfect Med-Rare. The Cheese: Go Burger offered a variety of quality cheese options. I opted for American on this outing. I am glad that I did, because my second choice, the Vermont Cheddar, would have been too salty. The Cheddar would have also masked the subtle notes of the beef blend. 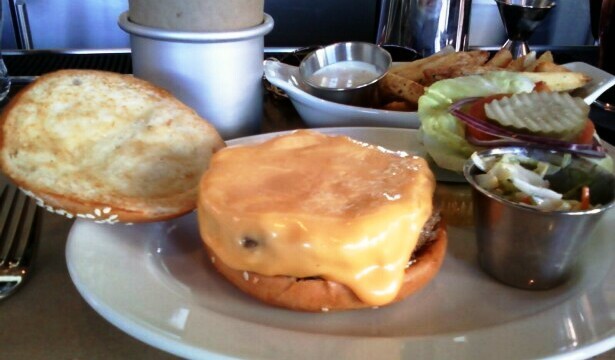 The American cheese was beautifully melted. It matched and accentuated the creaminess of the beef fat while bringing some tasty umami to the party. The cheese was a winner. The Bun: Breadbar provided the perfect buns. Breadbar can do no wrong in the burger bun department. This was a toasted, seeded burger bun, which was mildly sweet, a touch yeasty, moist, firm, yielding, and perfectly toothsome. The Meat to Bun Ratio: Perfect--just perfect. The Fries: The Skinny Fries were just right. They were perfectly seasoned, crisp, and creamy on the inside. They were cooked in a properly hot and fresh oil. The Duck Fries were a weak point. These were cut thicker, and they came out mealy. This was the result of the starting temperature of the oil being too low--the oil did end up at a hot enough temperature, as the burner kicked in, so these fries looked fine. It was the initial temperature variance that ruined the texture. 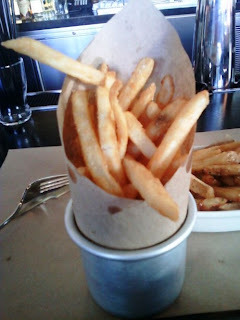 The chef at the pass agreed, comped the Duck Fat Fries, and sent out some Waffle Fries--they were perfect. The Value: It was $20 bucks for a cheeseburger, fries, soda, and the tip. This was a little pricey, but the quality of ingredients and skill of preparation were in place. Burger Review : Go Burger served up a darn good burger. I would have The Classic burger again, and I highly recommend it anyone that is in the neighborhood. 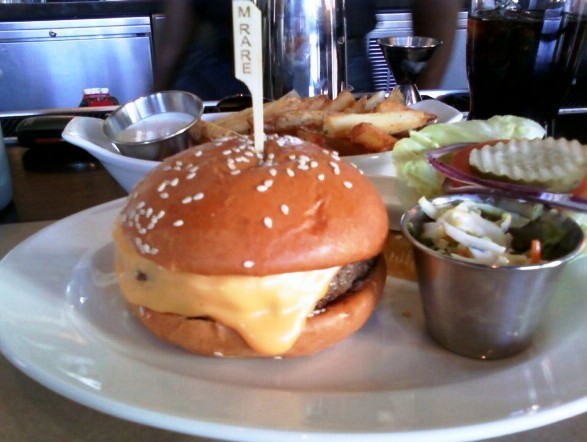 I will be returning to try the Prime STEAKHOUSE Burger. Their Ultimelt is the best "burger" I've ever eaten.